본 발명은 휴대 광고 시스템에서 휴대 광고 서비스 제공 방법 및 장치에 관한 것으로, 특정 그룹 구성원이 요청한 맞춤형 광고를 다른 사용자에게 전송하기 위한 선호도(preference) 공유 방법 및 장치에 관한 것이다. The present invention relates to a method and apparatus for a mobile advertising service provider in the mobile advertising system, the present invention relates to preference (preference) shares a method and apparatus for transmitting personalized advertising certain group members requested to other users. 휴대 광고 시스템에서 휴대 광고 서비스를 제공하기 위한 방법 및 장치에 관한 것이다. It relates to a method and apparatus for providing mobile advertising services on mobile advertising system. 이동통신 시장은 기존 기술들의 재조합 또는 통합을 통해 새로운 서비스의 생산을 지속적으로 요구받고 있다. The mobile market has been consistently require production of new services through recombination or integration of existing technologies. 오늘날 통신 및 방송 기술의 발달로 인해 종래의 방송 시스템 또는 이동 통신 시스템에서 핸드폰, PDA(Personal Digital Assistant)의 등 휴대 단말기(이하, "이동 단말")를 통해 광고 서비스를 제공하는 환경에 놓여 있다. Due to the development of today's communication and broadcasting technology lies in the conventional broadcast system or mobile communication system such as a mobile phone, (Personal Digital Assistant), PDA mobile terminal (hereinafter "mobile station") environment provided by an advertising service through. 이러한 잠재적이고 실제적인 시장 수요와 멀티미디어 서비스에 대해 급증하는 사용자 요구, 기존의 음성 서비스 및 데이터 서비스 외에 광고 서비스 등 새로운 서비스를 제공하고자 하는 사업자의 전략, 그리고 수요자의 요구를 수용하여 이동통신 사업을 강화하고 있는 정보 기술(Information Technology, 이하 'IT' 라 칭함) 기업들의 이해관계가 맞물려 이동통신 서비스와 인터넷 프로토 콜(Internet Protocol, 이하 'IP'라 칭함)의 융합은 차세대 이동통신 기술 개발의 큰 흐름으로 자리잡고 있다. Strengthen this potential and actual market demand and user demand soaring for multimedia services, the operator's strategy to offer new services such as traditional voice and data services in addition to advertising, and mobile communications business to accommodate customer needs and information technology (information technology, hereinafter 'IT' hereinafter) engages the interests of corporate relations mobile services and Internet Protocol (Internet Protocol, hereinafter 'IP' hereinafter) convergence is a big trend for next generation mobile communication technology development in situated in. 한편 오픈 모바일 얼라이언스(Open Mobile Alliance, 이하 “OMA”라 칭함)는 개별 모바일 솔루션의 상호 연동을 위한 표준을 연구하는 단체이다. The Open Mobile Alliance (referred to as Open Mobile Alliance, hereinafter "OMA") is an organization for studying the standard for interworking between individual mobile solutions. 상기 OMA는 이동통신용 게임, 인터넷 서비스 등에 대한 다양한 어플리케이션 표준을 정하는 역할을 주로 한다. The OMA mainly serves to establish various application standards for mobile games, Internet services. 특히 상기 OMA의 작업 그룹 중 OMA REQ(Open Mobile Alliance Requirement Working Group) 및 OMA CD(Open Mobile Alliance Content Delivery Working Group)에서는 휴대 광고(Mobile Advertising, 이하, “MobAd”라 칭함) 서비스 기술 표준을 연구하고 있다. In particular, and in the OMA OMA REQ (Open Mobile Alliance Requirement Working Group) and OMA CD (Open Mobile Alliance Content Delivery Working Group) of the working group studying the mobile ad (Mobile Advertising, hereinafter, "MobAd" hereinafter) service technical standard have. 상기 이동 단말은 상기 휴대 광고 서비스 기술을 표준으로 하고 있는 휴대 광고 시스템을 통해 맞춤형 광고가 제공되기 위해 광고 서비스 가입 시나 광고 요청 시 자신의 선호도(preference)를 광고 엔진을 통해 광고 서버에게 전송한다. The mobile station transmits to the ad server, their preference (preference) through advertising engine advertising when registering or when the ad request to be provided with a personalized advertising through mobile advertising system that the mobile ad serving technology as standard. 그러면 광고 서버는 광고주(Advertiser)로부터 수신한 광고 중, 사용자의 선호도 정보를 만족시키는 광고를 선택하여 광고 서버에 전달함으로 사용자에게 맞춤형 광고 서비스를 제공하게 된다. The ad server during received from advertisers (Advertiser) ads, select the ads that meet the user's preference information is to provide customized advertising to our users by forwarding to the ad server. 종래의 휴대 광고 서비스에서 맞춤형 광고를 받기 위해 사용자가 제공하는 선호도는 특정 사용자에게 특화된 개인정보임으로 이 정보를 본인 이외의 다른 사용자가 사용하는 것은 엄격하게 제한되어 있다. Preferences provided by the user in order to receive a custom ad from a conventional mobile advertising service is strictly limited to what the other person than I used this information arbitrarily specific personal information to a specific user. 예를 들어 아이팟(IPOD(IPOD는 애플(apple) 사에 의해서 디자인되고 마켓팅된 이동 가능한 멀티미디어 재생기이다.) 동호회 회원 중 한 사람이 다른 회원들도 자신이 수신한 광고를 받아볼 수 있게 하고자 하는 경우, 특정 사용자가 요청한 맞춤형 광고를 그룹 구성원들이나 다른 사용자들에게 전송하기 위해 특정 사용자의 선호도 정보를 그대로 사용하지 못한다. 또한 같은 정보를 포함하는 선호도를 그룹 구성원들이 각각 광고 서버에게 제공해 주어야만 한다. 그러면, 광고 서버는 수신한 각 사용자의 선호도 정보를 참고하여 사용자들에게 광고를 전송한다. For example, the iPod (IPOD (IPOD is a moveable multimedia player designed and is marketing by Apple (apple) four.) If you want to make one of the group members can receive ads that they receive, other Member in order to send personalized advertising a specific user requested to group members or other users do not accept the preference information from a user. also jueoyaman provide a preference to include the same information to each ad server group member. then, advertising server with reference to the preference information of each user receives and sends the ad to the user. 따라서, 특정 사용자가 설정한 선호도를 기반으로 광고 서버가 그룹의 구성원들이나 다른 사용자들에게 상기 특정 사용자와 같은 맞춤형 광고 서비스를 제공할 수 있는 선호도 공유 방법이 필요하다. Therefore, it is required that is based on the preferences set by the user-specific ad server is able to provide the group members or other users personalized advertising services, such as the particular user preference shares method. 본 발명은, 특정 사용자 정보의 선호도를 그룹 별로 공유하는 휴대 광고 시스템에서 휴대 광고 서비스 제공 방법 및 장치를 제공한다. The present invention provides a mobile advertising service providing method and apparatus in a mobile advertising system that share the preference information of the specific user groups. 또한 본 발명은 사용자 맞춤형 광고를 전송하기 위해서 특정 그룹 구성원이 요청한 맞춤형 광고를 공유된 사용자 정보를 사용해 다른 그룹 구성원들에게 광고를 전송할 수 있는 휴대 광고 서비스 제공 방법 및 장치를 제공한다. The present invention also provides a mobile advertising service provides a method and apparatus that can deliver advertising to other group members using shared tailored ads specific user group members requested information in order to send customized ads. 본 발명의 실시 예에 따른 방법은 휴대 광고 시스템의 광고 서버가 광고 서비스를 제공하는 방법에 있어서, 광고 엔진으로부터 사용자 목록과 그룹 사용자 선호도를 포함하는 광고 그룹 생성 요청 메시지를 수신하는 과정과, 상기 그룹 생성 요청 메시지의 사용자 목록과 그룹 사용자 선호도에 따른 그룹을 생성하는 과정과, 상기 그룹 생성 요청에 대한 응답 메시지를 상기 광고 엔진으로 전송하는 과정과, 상기 사용자 목록에 포함된 광고 엔진 중 하나로부터 광고 요청 메시지를 수신하는 과정과, 상기 그룹 사용자 선호도에 적합한 광고를 선택하는 과정과, 상기 선택된 광고를 상기 사용자 목록에 포함된 적어도 하나 이상의 광고 엔진으로 전송하는 과정을 포함한다. Method according to an embodiment of the present invention is a method that the mobile advertisement system, the ad server provides the advertising service, process, and the group receiving the ad group creation request message including a list of users and groups that the user preferences from the advertisement engine ad request from one of the ad engine comprises generating a set corresponding to the list of users and groups that the user preference of the generated request message and a reply message for the group creation request in the process, and the list of users transmitting to the advertisement engine receiving a message and includes the step of transmitting to the process, and at least one or more line engine with the selected advertisement to the user a list for selecting advertisement suitable for the user group preference. 또 다른 본 발명의 실시 예에 따른 방법은 휴대 광고 시스템의 광고 서버가 광고 서비스를 제공하는 방법에 있어서, 광고 엔진으로부터 그룹 사용자 정보를 포함하는 그룹 정보 업데이트 요청 메시지를 수신하는 과정과, 상기 그룹 정보 업데이트 요청 메시지에 업데이트 정보의 유무를 결정하는 과정과, 상기 업데이트 정보가 존재하면, 상기 업데이트 정보를 확인하여 저장하는 과정과, 그룹 정보 업데이트 응답 메시지를 상기 그룹 사용자 정보에 포함된 적어도 하나의 광고 엔진에 전송하는 과정과, 상기 그룹 사용자 정보에 포함된 상기 적어도 하나의 광고 엔진에 광고를 전달하는 과정을 포함한다. Another method according to an embodiment of the present invention is a method that the mobile advertisement system, the ad server provides the advertising service, the method comprising the steps of: receiving the group information update request message including a group of user information from the advertisement engine, the group information, the process of determining the presence or absence of the update information in the update request message and, if the update information is present, at least one advertisement engine included in the process of saving to check the update information, and the group user information, the group information update response message and a step of transmitting to, and includes the step of delivering advertising to the at least one advertisement engine included in the user group information. 본 발명의 실시 예에 따른 장치는 휴대 광고 서비스에서 휴대 단말기로 광고 서비스를 제공하는 광고 서버에 있어서, 사용자 목록 및 그룹 사용자 선호도와 사용자 목록을 포함하는 그룹 생성 요청 메시지를 광고 엔진으로부터 수신하는 수신부와, 상기 수신한 사용자 목록 및 그룹 사용자 선호도에 따라 그룹을 생성하는 사용자/서비스 / 단말 데이터 관리부와 상기 그룹 사용자 선호도에 따라 적합한 광고를 선택하기 위한 광고 선택부와, 상기 사용자 목록에 포함된 적어도 하나의 광고 엔진에 상기 선택된 광고를 전달하기 위한 광고 전송부를 포함한다. Device according to an embodiment of the present invention is an ad server that provides advertising services to the mobile terminal in a mobile advertising service, the receiving unit receiving the group creation request message including a list of users and groups that the user preferences and the user list from the advertising engine and , with the advertisement selection unit for selecting an advertisement in accordance with the received list of users and groups, the group with the user / service / terminal data management unit that creates a group according to user preference user preference, at least one included in the user list, It includes advertisement transmitting unit for transmitting the selected advertisement to the ad engine. 또한 본 발명의 실시 예에 따른 장치는 휴대 광고 서비스에서 휴대 단말기로 광고 서비스를 제공하는 광고 서버에 있어서, 그룹 사용자 정보를 포함하는 그룹 정보 업데이트 요청 메시지를 광고 엔진으로부터 수신하는 수신부와, 상기 그룹 정보 업데이트 요청 메시지에 업데이트 정보의 유무를 결정하고, 만약 상기 업데이트 정보가 존재하는지 확인하고, 만약 상기 업데이트 정보가 있으면, 상기 업데이트 정보를 포함하는 그룹 정보 업데이트 요청 메시지를 생성하도록 제어하는 제어부와, 상기 그룹 정보 업데이트 응답 메시지를 생성하기 위한 메시지 생성부와, 상기 그룹 사용자 정보에 대한 업데이트 정보를 저장하기 위한 메모리와, 상기 그룹 정보 업데이트 응답 메시지를 전달하고, 상기 그룹 사용자 정보에 포함된 적어도 하나의 광고 엔진에게 In addition, according to an exemplary embodiment of the present invention is an ad server that provides advertising services to the mobile terminal in a mobile advertising service, the receiving unit receiving the group information update request message including a group of user information from the advertisement engine, the group information, and determining the presence or absence of the update information in the update request message, if the said updated ensure that information is present, and if there is the update information, the control section for controlling to generate the group information update request message containing the updated information, the group at least one advertisement engine included in the information and a message generating unit for generating an update response message, the group users transfer information to the group information update response message memory, for storing the update information, and the group user information on to 광고를 전달하는 전송부를 포함한다. It includes parts of transport for delivering advertising. 본 발명의 실시 예에 따른 다른 장치는 휴대 광고 서비스에서 광고 서버로부터 광고 서비스를 제공받는 휴대 단말기에 있어서, 사용자 목록과, 그룹 사용자 선호도를 포함하는 그룹 생성 요청 메시지를 생성하는 사용자/서비스/단말 데이터 관리부와, 그룹 생성 요청 메시지를 광고 서버에 전송하고, 상기 광고 서버로부터 상기 그룹 생성 요청 메시지에 대한 응답으로 그룹 생성 응답 메시지를 수신하는 광고 획득 및 전송부와, 상기 광고 서버로부터 수신한 광고를 디스플레이 하는 광고 선택부와, 상기 광고 서버가 상기 사용자 목록에 포함된 특정 휴대 단말기로부터 광고 요청 메시지를 수신하면, 상기 서버는 상기 그룹 사용자 선호도에 대한 광고를 선택하고, 상기 선택된 광고를 상기 사용자 목록에 포함된 적어도 하나의 휴대 단말기로 전송함을 특 Another apparatus, according to an embodiment of the present invention is a portable terminal receives the advertisement service from the advertisement server in a mobile advertising service, the user list and group user / service / MS data for generating a group creation request message including the user preference management and group generate and send a request message to the ad server, displaying the group created with the portion ad acquisition and transmission of receiving a group creation response message in response to the request message, the advertisement received from the advertisement server from the advertisement server If the advertisement selection unit, the advertisement server receives the advertisement request message from a particular wireless terminal included in the user list, the server including the selected advertisement selecting an advertisement for the group of user preference, and the user list, at least one particular that the transmission to the mobile terminal 징으로 한다. And a gong. 본 발명의 실시 예에 따른 다른 방법은 휴대 광고 서비스에서 광고 서비스로부터 휴대 단말기가 광고 서비스를 제공받는 방법에 있어서, 사용자 목록 및 그룹 사용자 선호도를 포함하는 그룹 생성 요청 메시지를 생성하는 과정과, 상기 그룹 생성 요청 메시지를 광고 서버에 전송하는 과정과, 상기 광고 서버로부터 상기 그룹 생성 요청 메시지에 대한 응답으로 응답 메시지를 수신하는 과정과, 상기 광고 서버로부터 수신한 광고를 디스플레이하는 과정을 포함하되, 상기 광고 서버가 상기 사용자 목록에 포함되는 특정 휴대 단말기로부터 광고 요청 메시지를 수신한다면, 상기 광고 서버는 그룹 사용자 선호도에 대한 광고를 선택하고, 상기 선택된 광고를 상기 사용자 목록에 포함되는 적어도 하나의 휴대 단말기로 전송함을 특징으로 한다. Alternatively, according to an embodiment of the present invention provides a method receiving a portable terminal from the advertising service in a mobile advertising service provider or advertising service, the process of generating a group creation request message including a list of users and groups, user preferences, and the group and transmitting the generated request message to the ad server and, and receiving a response message in response to the group creation request message from the advertisement server, comprising the step of displaying the advertisement received from the advertisement server, the advertisement If the server receives the advertisement request message from the particular mobile terminal is included in the user list, the advertisement server sends at least one wireless terminal is selected the advertisement of the group user preferences and including the selected advertisement to the user list, characterized in that. 본 발명은 그룹 구성원이나 다른 사용자가 광고 서버로부터 특정 사용자가 요청한 것과 같은 맞춤형 광고를 수신받고자 할 경우, 각 사용자별 사용자 정보의 업데이트 정보를 전송하지 않고 선호도 설정을 공유할 수 있는 그룹 사용자 정보를 사용하여 사용자 정보의 전송 부하(overhead)를 줄일 수 있다. The present invention uses the group members and other users if you receive receive tailored ads, such as a particular user is requested from the ad server, group, user information that each user can share the updated information, the preference settings without transfer of user information and it is possible to reduce the load transmission (overhead) of user information. 또한 본 발명은 사용자 맞춤형 광고를 전송하기 위해서 여러 종류의 전송시스템을 지원할 수 있도록 목적된 휴대 광고 전송(Mobile Advertising, MobAd) 기술 중 특정 그룹 구성원이 요청한 맞춤형 광고를 공유된 사용자 정보를 사용해 다른 그룹 구성원들에게 전송할 수 있다. The present invention also other group members using a variety of transmission sent on mobile advertising purposes to support the system (Mobile Advertising, MobAd) shared tailored ads this particular group requested member of the technical user information in order to send customized ads It can be transferred to. 이하 본 발명의 바람직한 실시 예들의 상세한 설명이 첨부된 도면들을 참조하여 설명될 것이다. Will be described with reference to the drawings the following detailed description of the preferred embodiments of the present invention attached. 도면들 중 동일한 구성들은 가능한 한 어느 곳에서든지 동일한 부호들을 나타내고 있음을 유의하여야 한다. The same configuration of the figures should be noted that represents the same reference numerals even though where possible. 하기 설명에서 구체적인 특정사항들이 나타나고 있는데, 이는 본 발명의 보다 전반적인 이해를 돕기 위해 제공된 것이다. There are certain specific details it appears from the following description, which is provided to assist the overall understanding of the invention. 그리고 본 발명을 설명함에 있어, 관련된 공지 기능 혹은 구성에 대한 구체적인 설명이 본 발명의 요지를 불필요하게 흐릴 수 있다고 판단되는 경우 그 상세한 설명을 생략한다. And in the following description of the present invention, a detailed description of known functions and configurations that are determined to unnecessarily obscure the subject matter of the present invention, a detailed description thereof will be omitted. 후술될 상세한 설명에는 상술한 기술적 과제를 이루기 위한 본 발명에 있어서 대표적인 실시 예를 제시할 것이다. Detailed description will be described later, there will be present a representative embodiment according to the present invention for achieving the above-mentioned technical problem. 또한 본 발명의 설명의 편의를 위하여 비동기 이동통신 표준인 3GPP(3rd Generation Partnership Project) 혹은 이동 단말의 어플리케이션의 표준 기구인 OMA(Open Mobile Alliance)에서 정의하고 있는 개체들의 명칭들을 동일하게 사용할 것이나, 이러한 표준 및 명칭들이 본 발명의 범위를 한정하는 것은 아니며, 유사한 기술적 배경을 가지는 시스템에 적용 가능함은 물론이다. Also would equally use the names of the objects defined in the asynchronous mobile communication standard of 3GPP (3rd Generation Partnership Project) or the (Open Mobile Alliance) OMA standards body of mobile terminal applications, for convenience of the description of the present invention, such not intended to standards and names are limited to the scope of the invention, possible applied to a system having a similar technical background. FIG. 도 1a는 본 발명이 적용되는 이동 통신 시스템에서 휴대 광고 시스템과 각 엔터티간의 인터페이스에 대한 구조도를 나타낸다. Figure 1a shows a schematic block diagram of the interface between the mobile advertisement system and each entity in a mobile communication system to which the present invention is applied. 휴대 광고 시스템은 필수 구성 요소(mandatory components)인 광고 엔진(130)과 광고 서버(120)와 상기 필수 구성 요소가 제공하는 인터페이스(interface)로 구성될 수 있다. Mobile advertising system can be configured as an integral component (mandatory components) Ad engine 130 and the Ad server interface (interface) provided by the prerequisites and 120. 그 외 다른 구성 요소와 상기 구성 요소들 간의 인터페이스에는 휴대 광고 시스템과의 연동 관계를 나타낸다. Other interfaces between the component and other components, shows an interlocking relationship with a mobile advertising system. 상기 광고 엔진(130)은 단말기에 위치하는 휴대 광고 시스템 구성 요소로 상기 광고 서버(120)에 접속하는데 사용된다. The advertisement engine 130 is a mobile advertisement system component which is located in the terminal used to access the advertisement server 120. 상기 광고 엔진(130)은 휴대 광고 시스템을 활용하는 어플리케이션인 광고 어플리케이션(150)과의 연동(interaction) 및 광고 서버(120)와 접속하는데 사용된다. The advertisement engine 130 is used to connect with the linkage (interaction) and the Ad server 120 and the Ad application 150, the application to take advantage of a mobile advertisement system. 상기 광고 엔진(130)은 광고 어플리케이션(150)으로부터 휴대 광고 서비스에 접근(access)할 수 있는 기능을 지원할 수 있다. The advertising engine 130 may support the ability to access (access) to the mobile advertising service from the Ad application 150. 이 외에도, 광고 엔진(130)은 도 1b에 도시된 광고 엔진과 광고 서버의 상세 블록 구성도와 같이 광고 획득 및 전송부(Ad Acquisition and Delivery Function)(134)와, 광고 선택부(Ad Selection Function)(132)와, 광고 연동 결과 관리부(Ad Metrics Handling Function)(133)와, 사용자/서비스/단말 데이터 관리부(User/Service/Device data handling function)(131)로 구성될 수 있다. In addition, ad engine 130 is an advertising engine and a detail block diagram of the advertising server acquired advertising arrangement assist and a transmission unit (Ad Acquisition and Delivery Function) (134) and, advertisement selection unit (Ad Selection Function) illustrated in Figure 1b may be composed of 132, 131 ad interlocking result management unit (ad Metrics handling Function) (133), and a user / service / terminal management data (user / service / Device data handling function). 상기 광고 획득 및 전송 기능부(134)는 광고 서버(120)로부터의 광고 수신 및 수신받은 광고를 관리하고 전송한다. The ad acquisition and transmission function unit 134 manages the received advertisement, and receiving advertisement from the advertisement server 120 and transmitted. 또한 상기 광고 선택부(132)는 단말의 저장부(cache)(도면에 도시하지 않음)에 저장된 광고를 광고 어플리케이션(150)으로부터 제공되는 광고 요청 메시지 내 입력 데이터, 컨텍스트 및 개인화 정보(Contextualization and Personalization Information, 이하: C&PI) 등을 사용하 여 적절한 광고를 선택하는 기능을 제공한다. In addition, the advertisement selection unit 132, a terminal storage unit (cache) advertisement request message to the input data that is provided to ad stored on (not shown in the Figure) from the Ad application 150, context, and personalized information (Contextualization and Personalization of It provides the ability to select the appropriate ad than using C & PI) such as: Information, below. 상기 광고 연동 결과 관리부(133)는 광고 어플리케이션(150)으로부터 연동 결과 수신, 광고 엔진이 알고 있는 정보(예: 연동 결과가 측정된 시간)와 연동 결과의 결합, 수신한 연동 결과의 부정 여부(fraudulence) 확인 및 표기, 광고 서버(120)에 연동 결과를 제공하는 기능을 수행한다. The advertisement interlocking result management unit 133 is interlocked result received, information with a known advertisement engine from the advertisement application 150 (e.g., a peristaltic results measured time) and the coupling of the interlocking result, whether or no the received interlocking results (fraudulence ) functions to provide the result to the interlocking view and representation, advertising server 120. 상기 사용자/서비스/단말 데이터 관리부(131)는 사용자/단말의 동적/정적 정보의 관리, 휴대 광고 서비스 관련 데이터(예: rule, policy)를 제공하는 기능을 수행한다. The user / service / terminal data management section 131 is a user / dynamic / static management information of the terminal, the mobile advertising service related data and performs a function to provide a (for example, rule, policy). 상기 사용자/서비스/단말 데이터 관리부(131)는 하기에서 설명할 기술할 그룹 생성 요청 메시지 및 그룹 정보 업데이트 요청 메시지를 생성한다. The user / service / terminal data management section 131 generates a group creation request message and group information update request message to be described in the following description. 자세한 설명은 도 3 및 도 4를 설명하면서 하기로 한다. Detailed description will be given while explaining the Figs. 도 1b에 도시된 상기 광고 서버(120)는 네트워크에 위치하는 휴대 광고 시스템 구성 요소로 광고 엔진(130)과 서비스 제공자 어플리케이션(140)에게 광고를 제공한다. And it said advertisement server 120 shown in Figure 1b provides the advertisement to the mobile advertisement system component to the ad engine 130 and the service provider application 140, which is located in the network. 상기 광고 서버(120)는 광고 선택부(Ad Selection Function)(122), 광고 전송부(Ad Delivery Function)(123), 광고 연동 결과 관리부(Ad Metrics Handling Function)(124), 사용자/서비스/단말 데이터 관리부(User/Service/Device data handling function)(121)로 구성될 수 있다. The advertisement server 120, an ad selection unit (Ad Selection Function) (122), advertisement transmission unit (Ad Delivery Function) (123), ad interlocking result management unit (Ad Metrics Handling Function) (124), the user / service / terminal data management (User / Service / Device data handling function) can be configured with 121. 상기 광고 선택부(122)는 컨텍스 및 개인화 정보, 광고 메타데이터, 광고 룰(MobAd Rule) 등을 사용하여 적절한 광고를 선택하는 기능을 제공한다. The advertisement selection unit 122 provides a function of selecting an appropriate advertisement using the context, and personalized information, advertising metadata, advertising rules (Rule MobAd). 상기 광고 전송부(123)는 광고 엔진(130)과 서비스 제공자 어플리케이션(140)에게 광고 메타데이터(Ad Metadata)와 광고 또는 광고 캠페인(Ad Campaign), 광고 메타 데이터(Ad Metadata)와 광고 또는 광고 캠페인에 대한 참조(reference), 적절한 광고가 없음을 나타내는 지시자(indicator)등의 전송할 수 있다. The advertisement transmitting unit 123 Ad engine 130 and the service advertisement to the provider application 140 metadata (Ad Metadata) to the ad or ad campaign (Ad Campaign), advertisement metadata (Ad Metadata) to the ad or ad campaign reference to a (reference), indicator (indicator) that indicates that there is no appropriate advertisement may be transmitted, such as. 상기 광고 연동 결과 관리부(124)는 광고 엔진(130)과 서비스 제공자 어플리케이션(140)으로부터 수신한 광고의 노출빈도(impression)와 사용자 응답(response) 정보의 수집, 연동 결과와 관련된 정보(예: 광고가 노출된 시간 정보)의 수집 및 관리, 수집한 여러 연동 결과의 통합을 제공한다. The advertisement interlocking result management unit 124 is advertising engine 130 and the service provider application, frequency of the advertisement received from the (140) (impression) and the user response (response), acquisition of the information, information (such as related to interworking Results: Ad that provides collection and management, acquisition integration of several interlocking result of the exposure time information). 상기 사용자/서비스 데이터 관리부(121)는 사용자 컨텍스트 및 개인화 정보 관리, 휴대 광고 서비스 관련 데이터의 관리, 광고 제공을 위한 그룹 관리, 광고 채널의 관리, 광고와 광고 메타 데이터의 관리를 수행한다. The user / service data management unit 121 performs management of user context and personalization information management, mobile advertising service management of the related data, the group management for the advertising service, the management of the advertisement channel, ads and metadata. 상기 사용자/서비스 데이터 관리부(121)는 하기에서 설명할 기술할 그룹 생성 응답 메시지 및 그룹 정보 업데이트 응답 메시지를 생성한다. The user / service data management unit 121 generates a group creation response message and group information update response message to be described in the following description. 자세한 설명은 도 3 및 도 4를 설명하면서 하기로 한다. Detailed description will be given while explaining the Figs. 상기 광고 어플리케이션(150)은 단말에서 실행되는 외부 개체(external entity)로 광고 엔진(130)으로부터 광고를 요청 및 수신하며, 수신한 광고를 사용자에 보여주고, 광고의 연동 결과를 광고 엔진(130)에게 제공하는데 사용된다. The advertising application 150 is an external object (external entity) requesting and receiving the advertisement from the Ad engine 130 to, and to show the received advertisement to the user, advertisements a linkage results in the advertising engine 130 running on a terminal It is used to provide. 광고 어플리케이션의 예로는 메시징 클라이언트(messaging client), 웹 브라우져(web browser), 게이밍 클라이언트(gaming client) 등이 있다. Examples of advertising applications include messaging client (messaging client), web browser (web browser), a client gaming (gaming client). 상기 서비스 제공자 어플리케이션(140)은 외부 개체(external entity)로 광고 서버(120)로부터 광고를 요청 및 수신하며, 수신한 광고를 컨텐츠와 함께 사용 자에 보여주고, 광고의 연동 결과를 광고 서버(120)에게 제공하는데 사용된다. The service provider application 140 is an external object (external entity) to, and requests and receives the advertisement from the advertisement server 120, to show the received advertisement to the user along with the content, the linkage results in the ad, the ad server (120 ) it is used to provide. 광고 어플리케이션(150)의 예로는 웹 포탈(web portals), MMS 릴레이/MMS 서버(MMS(Multimeadia Messaging Service) Relay/Server), SMSC(Short Message Service Center), 게이밍 서버(gaming server) 등이 있다. Examples of advertising applications 150 may include web portal (web portals), MMS relay / MMS server (MMS (Multimeadia Messaging Service) Relay / Server), (Short Message Service Center) SMSC, gaming servers (gaming server). 개인화 및 개인화 자원(Contextualization and Personalization Resources: 이하 “C&PR”라 칭함)은 사용자와 관련된 정보의 저장소로 상기 정보의 관리 및 제공 방법은 휴대 광고 시스템에서는 정의하지 않는다. Personalization and personalization resource (Contextualization and Personalization Resources: under "C & PR" hereinafter) is a management and method of providing the information to store the information associated with the user is not defined in the mobile advertising system. C&PR의 예로는 사용자의 개인 특징, 선호도, 현재 상황 등이 있다. Examples of the C & PR is a personal features and preferences, such as the current situation. C&PR은 광고를 선택할 때, 사용자의 요구 사항을 파악하기 위해 사용된다. C & PR is when you select an ad and is used to identify the user's requirements. 하기 <표 1>은 도 1의 구성 요소(논리 개체)들 간에 사용되는 인터페이스를 나타낸 것이다. To <Table 1> shows the interface that is used between the components (logical entities) of FIG. 도 2는 종래의 휴대 광고 시스템에서 그룹 선호도를 관리하기 위한 광고 엔진-광고 서버간 동작 흐름도이다. 2 is advertisement engine for managing a group affinity in the conventional mobile advertising system is the ad server-to-server operational flow diagram. 맞춤형 광고를 서비스 받기 위해서 광고 엔진 B(130B)는 201 단계에서 그룹 생성 요청 메시지를 상기 광고 서버(120)에게 제공한다. Ad Engine B to receive a personalized advertising service (130B) provides a group creation request message in step 201 to the advertisement server 120. 상기 그룹 생성 요청 메시지에 포함된 정보는 광고 엔진 B(130B)를 사용하는 사용자의 선호도가 포함되어 있다. The information contained in the group creation request message includes a preference of the users of the ad engine B (130B). 일 예로 상기 광고 엔진 B(130B)를 사용하는 사용자의 선호도는 IPOD가 될 수 있다. For example a user's preference using the advertisement engine B (130B) may be an IPOD. 그러면 상기 광고 서버(120)는 203 단계에서 광고 엔진 B(130B)에 대한 인증 절차를 처리하고, 상기 그룹 생성 요청 메시지의 사용자 선호도에 따라서 그룹을 생성하고, 수신받은 그룹 생성 요청 메시지에 대한 응답 메시지를 생성하여 광고 엔진 B(130B)로 전송한다. Then, the advertisement server 120 may process the authentication procedure for the ad engine B (130B) at step 203, it generates a group according to user preference in the group creation request message and, in response to the reception received group creation request message, the message It generates and transmits to the advertisement engine B (130B). 이후 광고 엔진 A(130A)가 205 단계에서 상기 203 단계에서 광고 엔진 B(130B)가 생성한 그룹에 가입하기 위한 그룹 가입 요청 메시지를 광고 서버(120)로 전송한다. Since advertising engine A (130A) that sends a group join request message to join the group by the advertisement engine B (130B) generated in step 203 from the step 205 back to the ad server 120. The 상기 광고 서버(120)는 207 단계에서 광고 엔진 A(130A)에 대한 인증 절차를 처리하고, 수신받은 그룹 생성 가입 요청 메시지에 대한 그룹 가입 응답 메시지를 생성하여 광고 엔진 A(130A)로 전송한다. The advertisement server 120 may process the authentication procedure for the ad engine A (130A) in step 207, and generates a group subscription response message to the reception received group creation request to join message, and transmits it to the advertisement engine A (130A). 이후 광고 서버(120)는 209 단계에서 그룹원을 위한 광고를 광고 엔진 B(130B)으로 전송한다. Since advertising server 120 transmits an advertisement for the group members to the ad engine B (130B) at step 209. 또한 광고 서버(120)는 211 단계에서 상기 광고 엔진 B(130B)로 전송한 것과 같은 광고를 광고 엔진 A(130A)으로 전송한다. In addition, the ad server 120 sends an advertisement such as the one sent to B (130B), the ad engine in step 211, the Ad Engine A (130A). 도 2를 살펴보면, 종래의 휴대 광고 서비스에서 맞춤형 광고를 받기 위해 사용자가 제공하는 선호도는 특정 사용자에게 특화된 개인정보임으로 이 정보를 본인 이외의 다른 사용자가 사용하는 것은 엄격하게 제한되어 있음을 알 수 있다. Also look at the two, preferences provided by the user in order to receive a custom ad from a conventional mobile advertising service can be seen that strictly limit it to any other person than I used this information arbitrarily specific personal information to specific users . 이런 문제점을 개선하기 위해서 본 발명에서는 도 3 및 도 4를 이용하여 그룹 사용자 선호도 정보를 공유하기 위한 방법을 설명하기로 한다. In order to solve this problem by the present invention in reference to Fig. 3 and 4 will be described the method for sharing user group preference information. 도 3은 본 발명의 실시 예에 따른 휴대 광고 시스템에서 그룹 선호도를 관리하기 위한 광고 엔진-광고 서버간 동작 흐름도이다. 3 is advertising engine for managing the group preferences in the mobile advertisement system according to an embodiment of the present invention is the advertisement server-to-server operational flow diagram. 도 3에서는 휴대 광고 시스템에서 맞춤형 광고 송수신을 위한 그룹 사용자 선호도 정보 공유를 위한 그룹 생성 절차의 실시 예를 나타낸 것이다. Figure 3, illustrates an embodiment of a group creation procedure for the group of user preference information for the shared transmit and receive personalized ads from a mobile advertisement system. 상기 휴대 광고 시스템은 광고 엔진(광고 엔진 A(130A), 광고 엔진 B(130B))와 광고 서버(120)로 구성된다. The mobile advertising system is composed of advertisement engine (Ad engine A (130A), the ad engine B (130B)), and the ad server 120. The 상기 광고 엔진(130A, 130B)들은 모두 서로 다른 이동 단말에 위치하며, 광고 서버(120)에 접속하는데 사용된다. The advertisement engine (130A, 130B) are also all located in different mobile terminals and is used to access the advertising server 120. 또한 상기 광고 엔진 A(130A)과 상기 광고 엔진 B(130B)는 동일한 그룹임을 가정한다. In addition, it is assumed that the advertisement engine A (130A) and the advertisement engine B (130B) are the same group. 그룹 사용자 선호도 정보 공유를 위한 그룹 생성 절차는 광고 엔진(130A)이 그룹 생성 요청 메시지를 통해 광고 서버(120)에게 사용자의 선호도를 알리는 절차이고, 그 결과 상기 광고 서버(120)는 수신한 사용자의 선호도를 기반으로 맞춤형 광고 서비스를 광고 엔진 A(130A)와 광고 엔진 B(130B)에게 제공한다. Group for the group the user preference information sharing procedure of creating the ad engine (130A), the group creation request, and the procedure to ad server 120 via a message that the user's preferences, so that the advertising server 120 the user receives the provides customized advertising based on your preferences advertisement engine a (130A) and ad engine B (130B). 상기 도 3의 맞춤형 광고를 서비스 받기 위해서 광고 엔진 B(130B)는 301 단계에서 그룹 사용자 정보를 그룹 생성 요청 메시지에 포함하여 상기 광고 서버(120)에게 제공한다. The advertising engine B (130B) to receive a personalized advertising service of 3 is provided to the advertisement server 120, including the user group information in step 301, the group creation request message. 일 예로 상기 그룹 생성 요청 메시지의 정보는 하기 <표 2>와 같이 도시될 수 있지만 해당 표가 그 형태를 한정하지는 않는다. 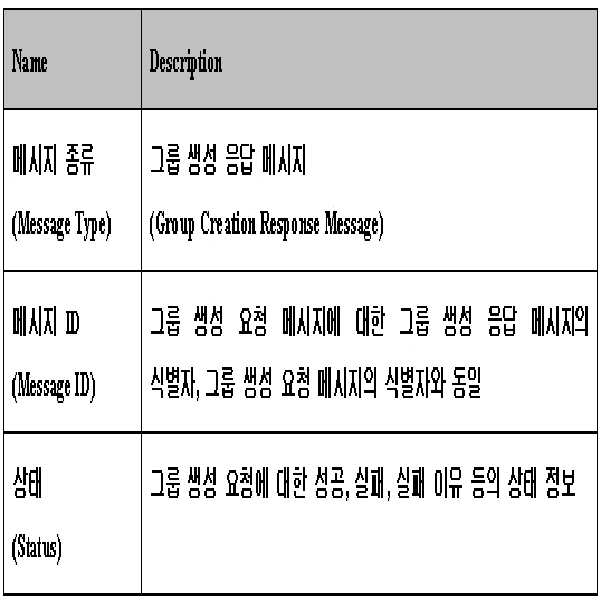 In one embodiment to the information of the group creation request message it can be shown as in the <Table 2>, but the corresponding table but the embodiment is not limited in shape. 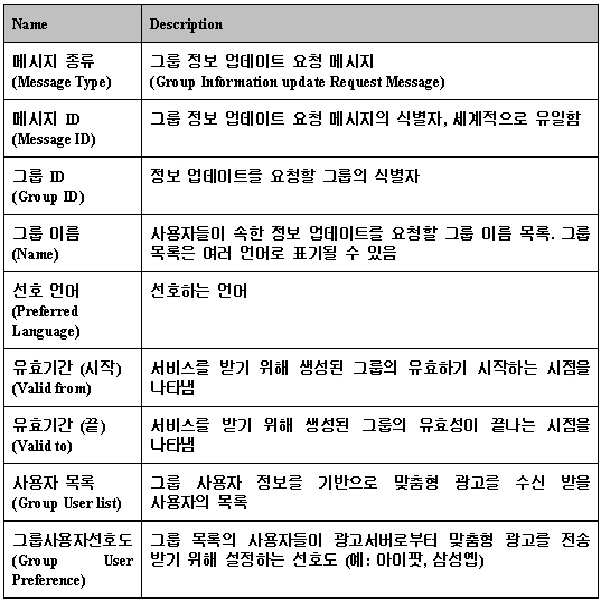 상기 <표 2>에 구성된 Message Type은 그룹 생성 요청 메시지(Group Creation Request Message)임을 나타낸다. 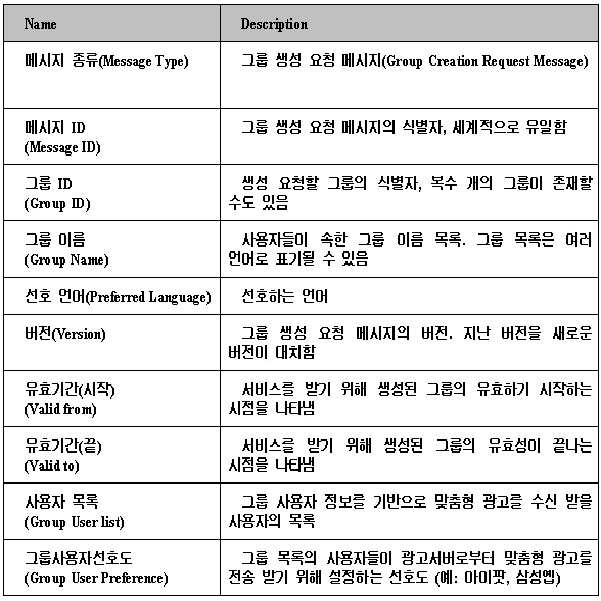 The <Table 2> Message Type indicates that the group is configured to generate a request message (Group Creation Request Message). Message ID는 그룹 생성 요청 메시지의 식별자를 나타내고, Group ID는 생성 요청할 그룹의 식별자를 나타내며 복수 개의 그룹이 존재할 경우 다른 Group ID를 나타낼 수 있다. Message ID indicates the identifier of the group creation request message, Group ID, if denotes the identifier of the group to request generation be more than one such group can represent the other Group ID. Group Name은 사용자들이 속한 그룹 이름의 목록을 나타내고, 그룹 이름 목록은 여러 언어로 표기될 수 있다. Group Name shows a list of users belonging to the group name, group name list can be written in several languages. Preferred Language는 선호하는 언어를 나타낸다. Preferred Language represents the language you prefer. 즉, Preferred Language는 어떤 언어로 된 광고를 수신받기 원하는지 그 선호도를 나타낸다. In other words, Preferred Language Download will want to receive ads in any language shows its preference. Version은 그룹 생성 요청 메시지의 버전을 나타낸다. Version represents the Group generated version of the request message. 광고 서버는 도 4에서와 같이 지난 버전을 새로운 버전으로 대치할 수 있다. The ad server can replace the last version, as shown in FIG. 4 to the new version. Valid from은 서비스를 받기 위해 생성된 그룹의 유효하기 시작하는 시점을 나타내고 Valid to는 서비스를 받기 위해 생성된 그룹의 유효성이 끝나는 시점을 나타낸다. Valid from shows when to begin to create a valid group for service Valid to indicate when the validity of the groups created in order to receive the service ends. Group User list는 그룹 사용자 정보를 기반으로 맞춤형 광고를 수신받을 수 있는 사용자의 목록을 나타낸다. Group User list shows a list of users who can receive customized ads based on user group information. Group User Preference는 그룹 사용자 정보를 기반으로 그룹 목록의 사용자들이 서버로부터 맞춤형 광고를 전송받기 위해 설정하는 선호도에 대한 기준들이다. Group User Preference are the criteria for setting preferences to receive customized ads sent from the server to the user's list of groups based on the user group information. 그룹 사용자 정보의 선호도에 대한 기준들을 한번에 여러 개가 설정될 수 있으며 설정된 기준들은 모두 해당 그룹 사용자 정보에 적용된다. Groups may be based on several dogs at once set about the preferences of the user information and established criteria are applied to all users in the group information. 상기 Group User Preference는 선호도에 대한 기준들로 Prefered Language, Genre, Brand 정보 등을 포함하고 있다. The Group User Preference are by reference to the preferences include Prefered Language, Genre, Brand information. 한편, 광고 서버(120)는 도 3의 303단계에서 광고 엔진 B(130B)에 대한 인증 절차를 처리하고, 수신 받은 그룹 생성 요청 메시지에 대한 응답 메시지를 생성하여 광고 엔진 B(130B)에게 전송한다. On the other hand, sent to the ad server 120 B (130B) ad engine handles the authentication process for an ad engine B (130B), in step 303, and generates a response message for the received group creation request message of Fig. 3 . 상기 광고 서버(120)는 305 단계에서 그룹 생성 요청 메시지에 대한 응답 메시지를 상기 <표 1>의 사용자 목록에 명기된 사용자들인 광고 엔진 A(130 A)에게 전송한다. The advertisement server 120 sends a response message to the group creation request message in step 305 to the <Table 1> The advertising engine A (130 A), which are the user specified in the user list. 305 단계는 선택적으로 수행될 수 있다. Step 305 may be optional. 또한 다른 예로, 305 단계는 광고 서버(120)에서 광고 엔진 A(130 A)로 전송할 수도 있고 전송하지 않을 수도 있다. In addition, another example, step 305 may not be transmitted may be transmitted from the advertisement server 120 to the ad engine A (130 A). 이때 303 단계와 305 단계는 동시에 진행될 수도 있고, 303 단계가 305 단계 보다 먼저 진행될 수도 있고, 305 단계가 303 단계 보다 먼저 진행할 수도 있다. At this time, step 305 and step 303 may take place at the same time, may take place than the first step 305, step 303 may proceed with step 305 before step 303. 일 예로 상기 사용자 그룹 생성 요청 메시지에 대한 응답 메시지에 포함되는 필드는 하기 <표 3>과 같이 도시 될 수 있지만 해당 표가 그 형태를 한정하지는 않는다. For example fields that will be included in the reply message for the user group creation request message it can be shown as follows in <Table 3> but the table is not limited in shape. 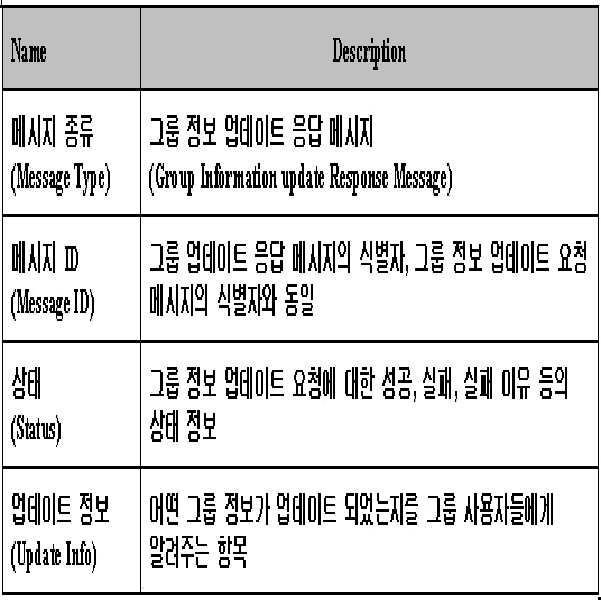 상기 303 단계와 305 단계에서의 응답 메시지에 포함되는 필드에서 Message Type은 그룹 생성 응답 메시지임을 나타내고, Message ID는 301 단계에서의 그룹 생성 요청 메시지에 대한 그룹 생성 응답 메시지의 식별자를 나타내고, 상기 응답 메시지에서의 Message ID는 301 단계에서의 그룹 생성 요청 메시지의 식별자와 동일한 식별자를 사용한다. The indicates that step 303 and the Message Type in the fields that will be included in the response message in step 305 is a group generated response message, Message ID indicates the identifier of the group generated response message to the group creation request message in step 301, the response message message ID is the same ID and the group creation request message in step 301, the identifier of the. Status는 그룹 생성 요청에 대한 성공, 실패, 실패 이유 등의 상태 정보를 나타낸다. Status indicates the status information such as success, failure, failure reason for the group creation request. 상기 303 단계와 305 단계에서와 같이, 그룹 생성 요청에 대한 절차가 성공적으로 이루어지면 상기 광고 서버(120)는 307 단계에서 광고 엔진 B(130 B)에게 그룹 사용자 선호도에 따라 맞춤형 광고를 선택하여 제공한다. The 303 as in step and step 305, when the procedure for group creation request is successful, the advertisement server 120 is provided to select a personalized advertisement according to the group user preference for the ad engine B (130 B) in step 307, do. 그리고 상기 광고 서버(120)는 309 단계에서 광고 엔진 A(130 A)에게 그룹 사용자 선호도에 따라 맞춤형 광고를 제공한다. And to the ad server 120 provides the personalized advertisement according to the advertisement in step 309 to the engine A (130 A), a group user preferences. 여기서, 307 단계와 309 단계는 동시에 진행될 수도 있고, 307 단계가 309 단계 보다 먼저 진행될 수도 있고, 309 단계가 307 단계 보다 먼저 진행될 수도 있다. Here, step 307 and step 309 may take place at the same time, may take place before step 307 is step 309, the step 309 may be conducted first than step 307. 이때, 광고 엔진 A(130 A)와 광고 엔진 B(130 B)에 제공되는 맞춤형 광고는 동일한 것이다. In this case, the customized advertising that is provided to the ad engine A (130 A) and Ad Engine B (130 B) are the same. 도 4는 본 발명의 실시 예에 따른 그룹 선호도 업데이트 제공 방법을 설명하기 위한 흐름도이다. 4 is a flowchart illustrating a group preference update service method according to an embodiment of the invention. 상기 휴대 광고 시스템은 광고 엔진(광고 엔진 A(130A), 광고 엔진 B(130B), 광고 엔진 C(130C), 광고 서버(120)로 구성된다. 상기 광고 엔진(130A, 130B, 130C)들은 모두 서로 다른 이동 단말에 위치하며, 광고 서버(120)에 접속하는데 사용된다. 그리고 도 4에서 광고 엔진 A(130A), 광고 엔진 B(130B)), 광고 엔진 C(130A)은 동일 그룹으로 가정한다. The mobile advertising system advertisement engine (Ad engine A (130A), the ad engine B (130B), the ad engine C (130C), is composed of ad server 120. The Ad engine (130A, 130B, 130C) are all to each other and located in another mobile terminal, it is used to access the ad server 120 and the ad engine a in Fig. 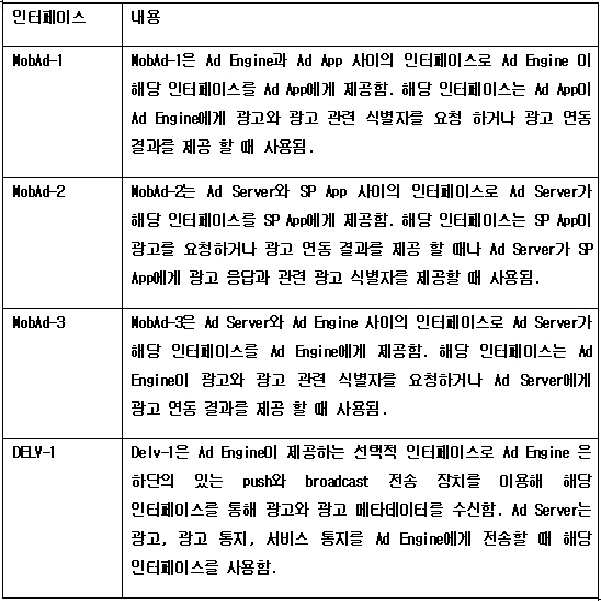 4 (130A), the ad engine B (130B)), ad engine C (130A) is assumed to be the same group . 광고 엔진 A(130A)는 401 단계에서 맞춤형 광고 서비스를 수신하기 위해서 광고 서버(120)에게 그룹 사용자 정보를 제공한다. Advertising engine A (130A) is to the advertiser server 120 to receive the personalized advertisement service in step 401 provides the user group information. 상기 그룹 사용자 정보는 하기 <표 4>에 도시하였다. The user group information, and the product was shown in <Table 4>. 상기 광고 엔진 A(130A)는 그룹 사용자 정보를 상기 그룹 정보 업데이트 요청(Group Information Update Request) 메시지에 포함하여 광고 서버(120)에게 제공한다. The advertisement engine A (130A) is provided to ad server 120, including the user group information in the group information update request (Group Information Update Request) message. 상기 그룹 정보 업데이트 요청 메세지에 포함된 필드는 하기 <표 4>과 같이 도시 될 수 있지만 해당 표가 그 형태를 한정하지는 않는다. The fields included in the group information update request message can be shown as follows in <Table 4> Although the table is not limited in shape. 한편, 광고 서버(120)는 도 3의 403 단계에서 광고 엔진 A(130 A)에 대한 인증 절차를 처리하고, 업데이트 사항이 존재할 경우, 상기 그룹 정보의 업데이트 사항을 확인하고 저장한다. On the other hand, the advertising server 120 may determine and store the processing when an authentication procedure for the advertisement engine A (130 A), and the present update information, update information of the group information at step 403 of FIG. 또한 광고 서버(120)는 403 단계에서 수신받은 그룹 정보 업데이트에 대한 응답 메시지를 생성하여 광고 엔진 A(130 A)에게 전송한다. In addition, the ad server 120 generates a response message to the group information update received in step 403 and transmits to the advertisement engine A (130 A). 상기 광고 서버(230)는 업데이트된 그룹 정보에 대한 응답 메시지를 하기 <표 5>의 수신받을 사용자의 목록에 기재된 광고 엔진 B(130 B)와 광고 엔진 C(130 C)에게 405 단계와 407 단계에서 전송한다. The advertisement server 230 to a response message for the updated group information <Table 5> step 405 to the ad engine B (130 B) and Ad engine C (130 C) The above list of the user receiving the received and step 407 of It transmits at. 405 단계와 407 단계는 선택적으로 수행될 수 있다. Step 407 and step 405 may be optional. 즉, 405 단계와 407 단계는 광고 서버(120)에서 광고 엔진 B(130 B)와 광고 엔진 C(130 C)로 전송할 수도 있고 전송하지 않을 수도 있다. That is, step 407 and step 405 may also be transferred from the advertisement server 120 to the Ad Engine B (130 B) and Ad engine C (130 C) may not be transmitted. 403 단계, 405 단계, 및 407 단계는 동시에 진행될 수도 있고, 403 단계가 405 단계와 407 단계 보다 먼저 진행될 수도 있고, 405 단계가 403 단계와 407 단계 보다 먼저 진행할 수도 있고, 407 단계가 403 단계와 405 단계 보다 먼저 진행될 수도 있다. Step 403, step 405, and step 407 may take place at the same time, step 403 is step 405 and step 407 than may first take place, and also the step 405 to proceed before step 407 and step 403, step 407 is a step 403 405 It may take place before more steps. 일 예로 상기 업데이트된 그룹 정보에 대한 응답 메시지의 정보는 하기 <표 5>와 같이 도시될 수 있지만 해당 표가 그 형태를 한정하지는 않는다. To the information in the response message for the updated group information, one example can be illustrated as shown in <Table 5>, but the corresponding table but the embodiment is not limited in shape. 그룹 사용자 정보 업데이트에 대한 절차가 성공적으로 이루어지면 상기 광고 서버(120)는 409 단계에서 광고 엔진 A(130 A)에게 그룹 사용자 정보에 설정된 선호도에 따라서 맞춤형 광고를 제공한다. Group and the procedure is successful, the advertisement server 120 for the user information update provide personalized advertising in accordance with the preferences set in the step 409 to the ad engine A (130 A) user group information. 그리고 상기 광고 서버(120)는 411 단계에서 광고 엔진 B(130 B)에게 그룹 사용자 정보에 설정된 선호도에 따라서 맞춤형 광고를 제공한다. And the advertisement server 120 may provide personalized advertising in accordance with the preferences set in the user group information to the advertising engine B (130 B) in step 411. 그리고 상기 광고 서버(120)는 413 단계에서 광고 엔진 C(130 C)에게 그룹 사용자 정보에 설정된 선호도에 따라서 맞춤형 광고를 제공한다. And the advertisement server 120 may provide personalized advertising in accordance with the preferences set in the user information to the ad engine group C (130 C) at step 413. 상기한 바와 같이, 409 단계, 411 단계, 및 413 단계는 동시에 진행될 수도 있고, 409 단계가 411 단계와 413 단계 보다 먼저 진행될 수도 있고, 411 단계가 409 단계와 413 단계 보다 먼저 진행할 수도 있고, 413 단계가 409 단계와 411 단계 보다 먼저 진행될 수도 있다. , Step 409, step 411, as described above, and step 413 may take place at the same time, may first proceed step 409 is more than 413 steps and 411 steps, the step is first may proceed, step 413 than the step 413 and 409. Step 411 the first may take place more than 411 steps and 409 steps. 따라서 본 발명은 그룹 구성원이나 다른 사용자가 광고 서버(120)부터 특정 사용자가 요청한 것과 같은 맞춤형 광고를 수신받고자 할 경우, 각 사용자 별 사용자 정보의 업데이트 전송 없이 선호도 설정을 공유할 수 있는 그룹 사용자 정보를 사용하여 사용자 정보의 전송 부하(overhead)를 줄일 수 있다. Thus, the present invention is the group members and other users if you receive receive tailored ads, such as a particular user is requested from the ad server 120, a group of user information that can be shared preference settings without updating the transmission of each user's information by users used to reduce the load transmission (overhead) of user information. 한편 본 발명의 상세한 설명에서는 구체적인 실시 예에 관해 설명하였으나, 본 발명의 범위에서 벗어나지 않는 한도 내에서 여러 가지 변형이 가능함은 물론이다. While the invention has been shown and described with reference to certain preferred embodiments thereof, various modifications are possible within the limits that do not depart from the scope of the invention. 그러므로 본 발명의 범위는 설명된 실시 예에 국한되어 정해져서는 안되며 후술하는 특허청구의 범위뿐 아니라 이 특허청구의 범위와 균등한 것들에 의해서 정해져야 한다. While the invention has been limited to the described embodiments jeonghaejyeoseo shall be defined by the scope of the claims, as well as the claims, which must not be described later and their equivalents. 도 4는 본 발명의 실시 예에 따른 휴대 광고 시스템에서 휴대 광고 서비스 제공하기 위해 광고 엔진-광고 서버간 동작 흐름도(그룹 정보 업데이트 방법). Figure 4 is a mobile advertisement system, the mobile advertising service to provide advertising engine according to an embodiment of the present invention between an ad server operation flowchart (group information update method). 상기 선택된 광고를 상기 사용자 목록에 포함된 적어도 하나 이상의 광고 엔진으로 전송하는 과정을 포함하는 광고 서비스 제공 방법. Ad service providing method comprising the step of transmitting the selected advertisement to the at least one or more of the ad engine in the user list. 상기 사용자 목록에 포함된 광고 엔진은 동일 그룹임을 특징으로 하는 광고 서비스 제공 방법. How to provide advertising services to the advertising, it characterized in that the engine is the same group that contains the user list. 상기 그룹 생성 요청 메시지의 현재 버전을 나타내는 버전(Version) 필드를 포함하는 광고 서비스 제공 방법. Advertising services comprising the current version represents the version (Version) fields in the group generation request message. 상기 선택된 광고는 광고 메타데이터(Ad Metadata)와 광고 또는 광고 캠페인(Ad Campaign), 광고 메타 데이터(Ad Metadata)와 광고 또는 광고 캠페인에 대한 참조(reference), 적절한 광고가 없음을 나타내는 지시자(indicator) 중 적어도 하나를 포함하는 광고 서비스 제공 방법. The selected line is a reference to the advertisement metadata (Ad Metadata) to the ad or ad campaign (Ad Campaign), advertisement metadata (Ad Metadata) to the ad or ad campaign (reference), indicator (indicator) that indicates that there is no appropriate advertisement how to provide advertising services to include at least one. 상기 선택된 광고는, C&PI(Contextualization and Personalization Information), 광고 메타데이터 및 광고 규칙 중 적어도 하나를 사용하여, 선택되는 광고 서비스 제공 방법. The selected line is, C & PI (Contextualization and Personalization Information), ad metadata and ad using at least one of the rules, advertising service provider is selected. 상기 그룹 사용자 정보에 포함된 상기 적어도 하나의 광고 엔진에 광고를 전달하는 과정을 포함하는 광고 서비스 제공 방법. Ad service providing method comprising the step of delivering advertising to the at least one advertisement engine included in the user group information. 상기 그룹 사용자 정보에 포함된 선호도에 따라서, 상기 광고를 전달함을 특징으로 하는 광고 서비스 제공 방법. Method for providing advertising services, characterized in that, the advertisement delivery according to the preference information included in the user group. 상기 그룹 사용자 정보에 포함된 광고 엔진은 동일한 그룹임을 특징으로 하는 광고 서비스 제공 방법. Advertising a service providing method, characterized in that the group advertisement engine included in the user information is the same group. 상기 사용자 목록에 포함된 적어도 하나의 광고 엔진에 상기 선택된 광고를 전달하기 위한 광고 전송부를 포함하는 광고 서버. The user list advertising server including advertisement transmitting unit for transmitting the selected advertisement to the at least one advertisement engine contained. 상기 사용자 목록에 포함된 광고 엔진은 동일한 그룹임을 특징으로 하는 광고 서버. Ad server, characterized in that the advertising engine that is included in the user list of the same group. C&PI(Contextualization and Personalization Information), 광고 메타데이터 및 광고 규칙 중 적어도 하나를 사용하여, 상기 적합한 광고를 선택하는 광고 서버. C & PI (Contextualization and Personalization Information), ad metadata using at least one of data and advertising rules, the ad server for selecting the appropriate advertising. 상기 그룹 정보 업데이트 응답 메시지를 전달하고, 상기 그룹 사용자 정보에 포함된 적어도 하나의 광고 엔진에게 광고를 전달하는 전송부를 포함하는 광고 서비스를 제공하는 광고 서버. Transferring the group information update response message, and the group of at least one advertisement engine ad server that provides advertising services including a transmission for transmitting the advertisement to include the user information. 상기 그룹 사용자 정보에 포함된 광고 엔진은 동일한 그룹임을 특징으로 하는 광고 서버. The group ad engine in the user information, an ad server, characterized in that the same group. 상기 제어부는 그룹 정보 업데이트 절차의 완성 여부를 결정하고, 상기 광고를 상기 그룹 사용자 정보에 포함된 적어도 하나의 광고 엔진에 전송하는 광고 서버. The control unit for determining the completion of the group information update procedure, and transmitting the at least one advertisement engine with the advertisement to the user group information ad server. 상기 광고 서버가 상기 사용자 목록에 포함된 특정 휴대 단말기로부터 광고 요청 메시지를 수신하면, 상기 서버는 상기 그룹 사용자 선호도에 대한 광고를 선택하고, 상기 선택된 광고를 상기 사용자 목록에 포함된 적어도 하나의 휴대 단말기로 전송하는 휴대 단말기. If the advertisement server receives the advertisement request message from a particular wireless terminal included in the user list, the server at least one mobile terminal includes selecting an advertisement for the group of user preferences, and the selected advertisement to the user list, a wireless terminal to be transmitted to. 상기 사용자 목록에 포함된 휴대 단말기는 동일한 그룹에 포함됨을 특징으로 하는 휴대 단말기. A portable terminal as claimed is included in the same group is a wireless terminal included in the user list. 상기 선택된 광고는 광고 메타데이터(Ad Metadata)와 광고 또는 광고 캠페인(Ad Campaign), 광고 메타 데이터(Ad Metadata)와 광고, 광고 캠페인에 대한 참조(reference), 적절한 광고가 없음을 나타내는 지시자(indicator) 중 적어도 하나를 포함하는 휴대 단말기. The selected line is a reference to the advertisement metadata (Ad Metadata) to the ad or ad campaign (Ad Campaign), advertisement metadata (Ad Metadata) and ad, ad campaign (reference), indicator (indicator) that indicates that there is no appropriate advertisement at least one mobile terminal including a one. 상기 선택된 광고는, C&PI(Contextualization and Personalization Information), 광고 메타데이터 및 광고 규칙 중 적어도 하나를 사용하여 선택됨을 특징으로 하는 휴대 단말기. The selected line is, C & PI (Contextualization and Personalization Information), ad metadata and advertising rules portable terminal, characterized in that using at least one selected from. 상기 사용자/서비스/단말 데이터 관리부는 그룹 정보 업데이트 요청 메시지를 생성하고, 상기 광고 획득 및 전송부는 상기 그룹 정보 업데이트 요청 메시지를 상기 광고 서버로 전송하고, 상기 광고 서버로부터 상기 그룹 정보 업데이트 요청 메시지에 대한 응답으로 그룹 정보 업데이트 응답 메시지를 수신하는 휴대 단말기. The user / service / terminal data management unit generates the group information update request message, and obtains the advertisement and a transmitting unit for transmitting the group information update request message to the ad server, and from the ad server in the group information update request message, a wireless terminal in response to receiving the group information update response message. 상기 광고 서버가 상기 사용자 목록에 포함되는 특정 휴대 단말기로부터 광고 요청 메시지를 수신한다면, 상기 광고 서버는 그룹 사용자 선호도에 대한 광고를 선택하고, 상기 선택된 광고를 상기 사용자 목록에 포함되는 적어도 하나의 휴대 단말기로 전송함을 특징으로 하는 휴대 광고 서비스를 제공받는 방법. If the advertisement server receives the advertisement request message from the particular mobile terminal is included in the list of users, the advertising server has at least one portable terminal that includes selecting an advertisement for the group of user preferences, and the selected advertisement to the user list, how to provide mobile advertising service that is characterized by a transfer. 상기 광고 서버로부터 상기 그룹 정보 업데이트 요청 메시지에 대한 응답으로, 그룹 정보 업데이트 응답 메시지를 수신하는 과정을 더 포함하는 휴대 광고 서비스를 제공받는 방법. How to provide the mobile advertising service, further comprising the step of: from the advertisement server in response to the group information update request message, receives the group information update response message. 상기 사용자 목록에 포함되는 휴대 단말기는 동일한 그룹임을 특징으로 하는 휴대 광고 서비스를 제공받는 방법. A wireless terminal included in the user list, the method receiving a mobile advertising service characterized in that the same group. 상기 선택된 광고는 C&PI(Contextualization and Personalization Information), 광고 메타데이터 및 광고 규칙 중 적어도 하나를 사용하여 선택됨을 특징으로 하는 휴대 광고 서비스를 제공받는 방법. The selected advertisement method receiving a mobile advertising service, characterized in that the selection using at least one of the C & PI (Contextualization and Personalization Information), ad metadata and advertising rules.